Our flame retardant labels are designed to survive temperatures up to 1100F and short exposure to open flame. The rise of electronics manufacturing is causing a need for batteries that last longer durations and operate for more lengthy periods. Devices such as laptops, mobile phones, tablets and digital assistants demand more powerful batteries and with that, a higher chance of flame propagation. The cost of a potential flame transpiring inside an electronic device is no match for the cost of unhappy or injured consumers. Harm to your customers by flame or gases given off by the materials at high temperatures are immeasurable. ImageTek Labels offers LMK1603, a flame retardant polyimide label that is halogen-free and effectively controls heat transfer, oxygen availability and material breakdown. Environmentally safe and compliant EU, ROHS and REACH initiatives, LMK1603 offers dimensional stability at high temperatures and is resistant to most chemicals and solvent used in electronics manufacturing and tested to uphold UL94 standards. New to the ImageTek Labels line of flame retardant materials is LMK1611. This material is a unique top coated polyethylene terephthalate film and adhesive combination, that provides flame retardant performance. 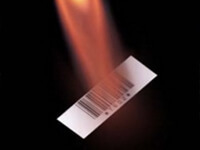 Traditional polyester labels burn rapidly and will not meet emerging flame retardant requirements. LMK1611 uses halogen free, flame retardant technology that provides significant “self-extinguishing” performance. LMK1611 is a 1.5 mil white polyester label material designed for thermal transfer and flexographic printing. When matched with the proper inks or halogen free thermal ribbons, the printed image on the LMK1611 will withstand harsh chemicals and solvents typically found in the electronic manufacturing process. LMK1611 complies with the requirements of RoHS, REACH, and is certified to be halogen free to the IEC 61249-2-21 levels.